What’s wrong with this picture? I’ll start out by simply saying “a lot.” But let’s get specific. I’m assuming the parking lot was just painted, but nowhere is this stated. A simple sign on one of the poles could alert potential parkers that the parking lot is closed until the paint dries. Listen, crowd control equipment doesn’t need to be pretty. 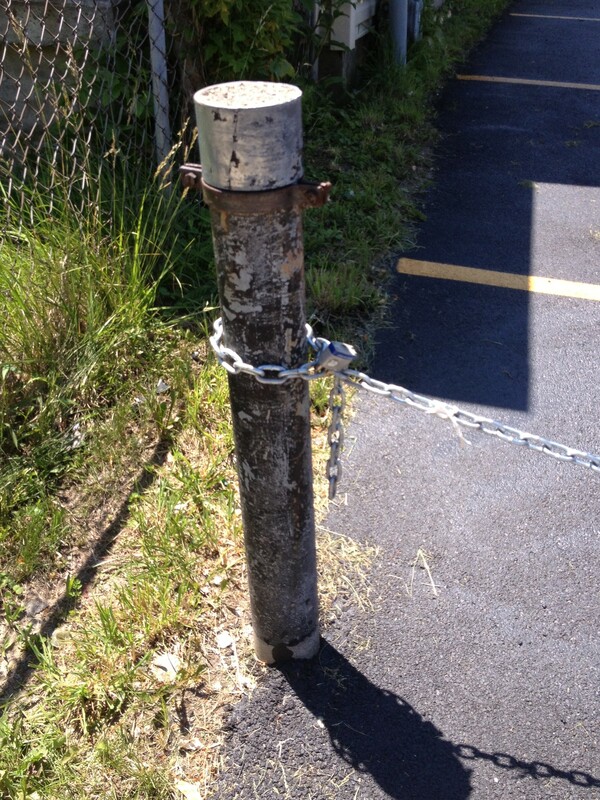 But if they’re using these makeshift stanchions to keep people out of a freshly painted parking lot – which does look beautiful – then these rusty, metal poles are taking away from that. 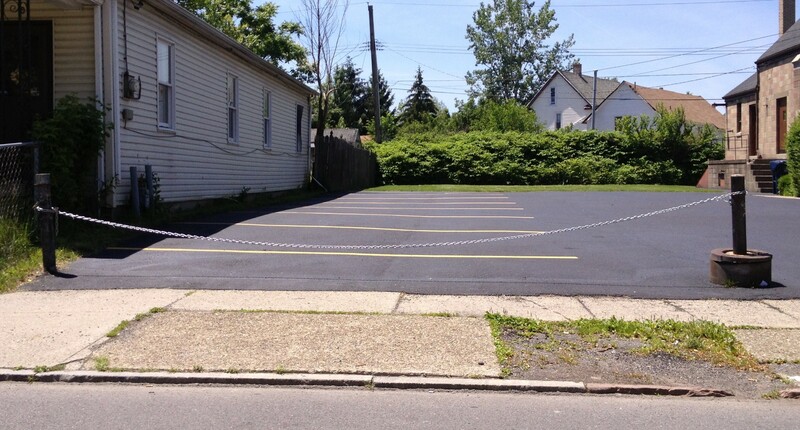 They leave a bad impression on whoever did the work on the lot, and also on all of the other surrounding properties. If you look at the picture above, you’ll see that there is a third “stanchion” – if you’d even call it that – off to the right, without any sort of rope or chain connecting it to the middle stanchion. Therefore, if the intended purpose of this barrier is to keep cars off the parking lot, it simply won’t work. There’s a 20-foot gap there that any vehicle could pass through. 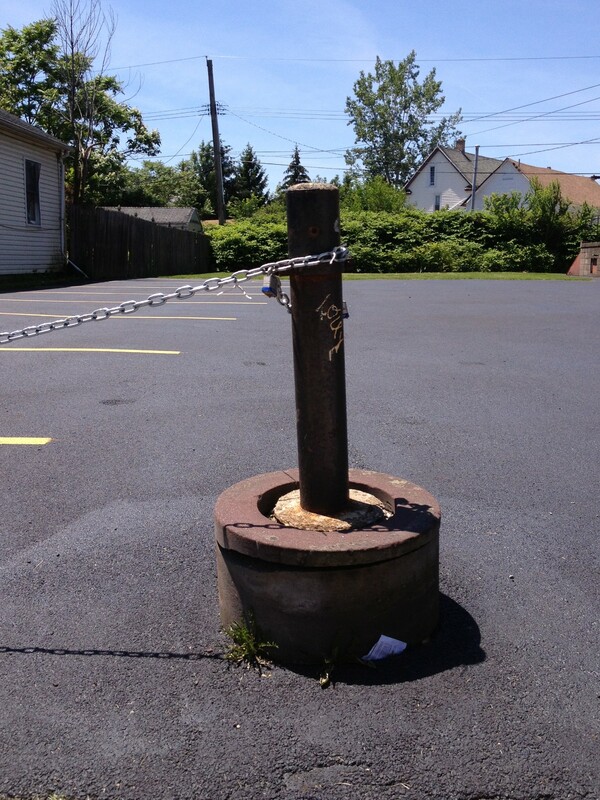 Notice how old and rusty these parking lot poles really are. I won’t say where this is, but I took these pictures myself, and I know this is a highly trafficked area. There are tons of kids around, playing on the sidewalks, oftentimes, in this very parking lot. If one of them were to cut themselves on this pole, it could prove to be a very bad situation for whoever’s responsible for the system. Not to mention, while the chain is visible at most times, when it’s sunny out, it can become quite inconspicuous, and it could be a tripping hazard for anyone – not just children. So what should be done? I think you know what I’m going to suggest. A simple set of outdoor retractable belt stanchions would do the job just fine. They’re clean, they look nice, and they’ll keep people away from the lot. Cone-mounted crowd control is another solid option. If you’re interested in a crowd control system for your business, give us a call – 1.888.404.7892. And if you ever see a shameful crowd control serup like this one, snap a picture, and send it to info@LineLogic.com. We’d love to blog about it.